Ta-Da! Meet Me at the R&F Barn. Ta-Da! Join Me at the Barn. Who knew I would love giving clinics this much? In the past, I’ve always done a scant few a year here in Colorado, but the last two years have run me full tilt around the globe. It’s a huge learning opportunity to be able to work with so many more horses and riders than I could by staying local. Apparently being a clinician is like riding; you improve the more time you spend in the saddle. Designing my clinics, I try to combine my past experience attending clinics (some of the best and worst memories with my horses), with a method of teaching that I wish someone had used with me, and then season it all with my dearest wish for better understanding for horses living in a human world. A lofty goal, but I’m happy with how it’s going so far. There’s a comment I hear often, “I can’t unsee this.” Initially, I took it as a compliment, hoping I’d done a good job describing and explaining. Horses always backed me up, standing next to me with their body language saying the thing I was verbalizing, and it was so obvious that we’d all laugh. I got wonderful testimonials and the people who came to my clinics were open-minded folks trying their best for their horses. It’s been a happy bubble. Sometimes people told me that they couldn’t find a local trainer like me, and I’d try to be humble and smile. I can be insufferably dense sometimes. On the way to the hotel after a clinic, the organizer “complimented” me with an edge that I finally heard. She insisted she really had to quit her trainer and there were no other options. None. And commuting 7000 miles to ride with me wasn’t going to work. It was almost like I’d pulled the rug out from under her. I felt like apologizing. With the same kind bluntness, she went on to tell me that she subscribed to two other trainers online, but she really wanted to subscribe to me online. Then we both acknowledged that I didn’t have an online program. It isn’t that I hadn’t thought about it. Half my friends (I know both the trainers she followed) have them and they’re doing a good job. If I was to take it on, it would need to be different enough to be worthwhile, remain true to what I train, and offer value to followers. Not to mention my tiresome aesthetic requirements. One more challenge, I’m not convinced we can learn the fine art of training from how-to videos where we sometimes do more damage than good for horses. What if this art of training should be passed hand to hand, human to horse, the old-fashioned and ridiculously limited way? And is anyone as old-fashioned as me? I write, for crying out loud. Not with a quill, but low tech for sure. And I recently found out that blogs are terribly outdated now. Apparently, everyone has moved on, and here I am, close to nine years in with no plans for extinction. I’m a blogasaurus, the opposite of a T-Rex, I have spindly legs but very agile fingers. The organizer and my friends are right, of course. I’ve been resistant but after that proper shove, the idea had a runaway in my skull. I asked advice, made some lists, bought a bunch of tech gear that I can’t figure out how to use, and made a start on my online program. Rule one: It has to feel personal. Audio blogs read by me. Podcasts like where we breathe together in the saddle. Short videos describing some of my favorite riding exercises. Signal Speak: Reading calming signals on my videos and yours. A re-organized library of past blogs grouped by topic. Reduced rate for one-on-one time with me. Q&A from members with answers longer than I can write on Facebook. A mentor corner to share ideas among trainers and where I can form a list of local referrals. Insert your best idea here. You are the one who knows. My favorite part might be the daily quote. It’s been a collaborative effort between my new tech goddess, a few mentors and friends, and me. The new website will roll out in January, with a subscription fee. Before that, I’ll be leaking bits and pieces over the next weeks. Finally, the boulder blocking the path was what to call this place in cyberspace. Isn’t naming the hard part? Naturally, I over-thought it, then all the words ran together, most being overused and understated, or just plain lame. Cleverness bumped up against wordiness. Brain cells died painful deaths. Breathe, Anna. Less is more. The things I hear most from readers and riders are that they feel isolated. They struggle with peers who are critical. Most want support with a different training approach saying old methods, “always felt wrong but it’s what I was taught.” And there is no place locally. Then Edgar Rice Burro, the brains in the herd, sagely nodded, enthusiastic that I was inviting everyone to the barn. At first, I thought he misunderstood me but he’s so right, it’s just the best place I know. Let’s meet here at the Barn. To be clear, the blog will continue exactly the same, and it will always be free! Free to read, free of sponsors, and free of ads. As free as a gallop, and as timeless as a cave painting. I’m a belligerent blogasaurus and that will not change. You can still join us on Facebook here and here. And if you want even more, something inclusive and deeper, join us in the Barn. We’re supportive, committed to learning and putting the horse first. 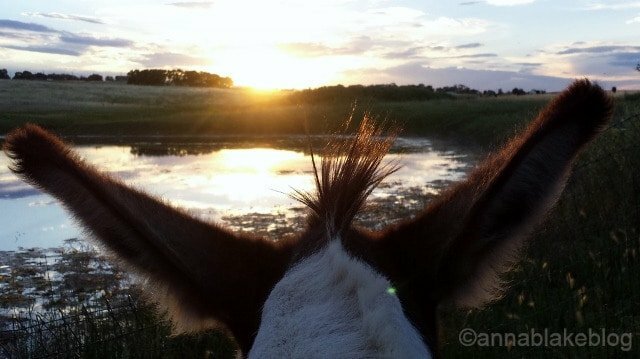 We’re grateful to be part of a Relaxed & Forward tribe with the goal of changing the horse world for the better. Traveling has shown me that there are more of us than we think. Oh. Edgar Rice Burro reminds me that if we’re going to be working with less intelligent creatures than him, meaning horses, we’ll need to keep a sense of humor, too. Planning our 2019 clinic schedule now. Email ambfarm@gmail.com for hosting details or to be added to the email list. ← Forward: Relaxed or Lazy?